All of the classes have finished their individual mosaic pieces for the class auction projects. The students worked hard and did a fantastic job! Now it’s time to assemble all the pieces together in the frames for the auction. If anyone would like to help put a class together with Ms. Colahan, please contact her. The projects can be taken home and they can be assembled on your own time. All classes will continue working on grade level projects. Ms. Colahan will post most popular projects on Artsonia so parents can see what your students are making in art class. All artwork will be sent home in May. You can design and purchase gifts and other works of art using your student’s artwork on Artsonia. It’s a great idea for Christmas gifts! Second quarter brings a transition from ‘fall’ to ‘winter’ as the focus shifts to the Christmas concerts on December 16th and December 17th, both start at 7 p.m. in the gym. The concert Wednesday, December 16 will start with preschool, pre-K and kindergarten. Students need to wear ‘dress’ church clothes–holiday colors. The students are working on several holiday songs. 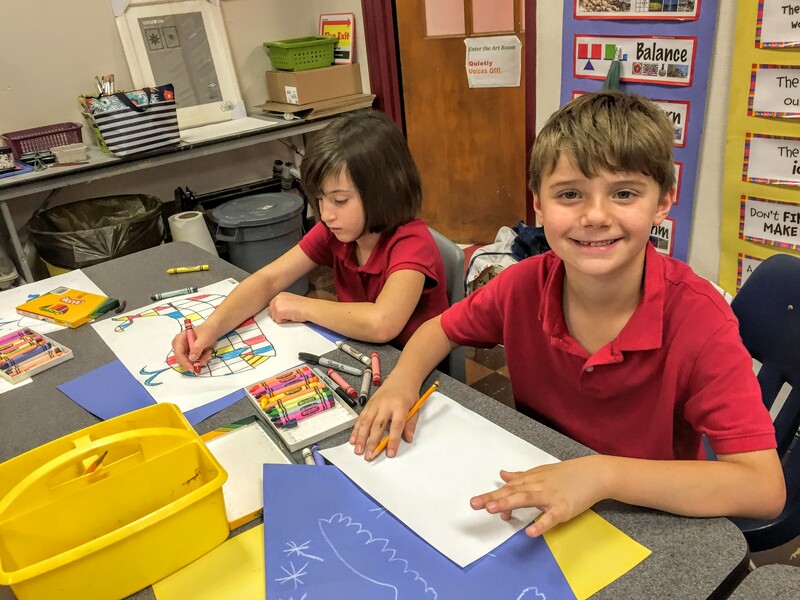 On Wednesday, December 16, the main event, “Starry Night, Noisy Night,” will feature first, second and third grades. The dress for the musical is Biblical costume or ‘dressy’ church clothes. Those students who have received a part will need to dress for that part, a biblical costume. (No jeans or t-shirts!). Students need to report to their classrooms. The concert Thursday, December 17 features fourth-eighth grade choirs and sixth-eighth grade band. The students will need to dress up with ‘dress’ church clothes. (No jeans or t-shirts!) Students need to report to their assigned spots in the gym. First quarter was very busy in physical education with activities such as parachute games, bocce tournaments, kickball, obstacle course design, ring toss math, scooter relays, fitness tests and Zumba. Research shows that physical activity influences how the brain develops, increasing the ability to learn and be creative. 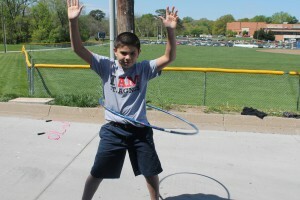 St. Agnes Physical Education goes way beyond the learning and playing of games. Habit 1: Be Proactive. Take responsibility for your actions, attitudes and moods. Don’t blame others. Have a ‘can do’ attitude. Do the right thing without being asked, even when nobody is looking. Habit 2: Begin with the End in Mind. Plan ahead and set goals. Do things that have meaning and make a difference. You are an important part of your classroom. Look for ways to be a good citizen. 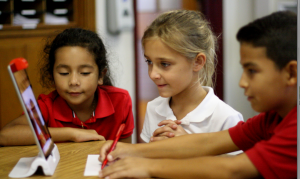 St. Agnes students will focus on Cultural Awareness for the month of November. We will begin with Dia de los Muertos. Come check out our ‘ofrenda’ altar in front of the Spanish classroom. Our students will learn about this wonderful Mexican tradition. Students are welcome to bring pictures or items of deceased loved ones who they would like to honor. The sixth graders are doing a FANTASTICO job on their Spanish Country Reports. They have learned to do research and how to present their information to their peers. It has been such a great and fun experience for them. Middle school students recently started their Movie Maker projects entitled, “The Beatitudes”. This project consists of creating a visual and auditory presentation of The Beatitudes using images, text, motion, and music. 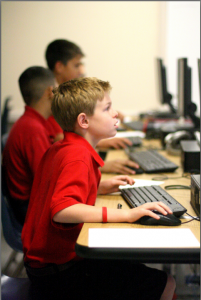 Sixth graders are using their newly honed Microsoft Word skills to create business cards. They are becoming proficient in “search and replace” features as well as, cropping images, inserting text boxes and manipulating font styles. In addition, the fifth graders are completing their Ten Commandments Power Point presentations to be displayed during the first week of December. The students used Power Point to create original masterpieces that highlight the Ten Commandments. Sound, graphics, transitions, animations, timing and music are being applied throughout their projects. Feel free to stop by during their presentations. Celebrate your child’s birthday (or any special occasion) in a unique way while helping to grow the library book collection. 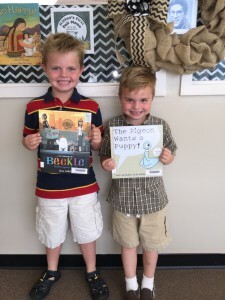 Birthday book donations do not have to coincide with a birthday. You can do it at any time. A donation of $15 will give your student the opportunity to select a book to be added to the St. Agnes library. The chosen book will have a special nameplate with your student’s name and birthday. Your student will be the first to check it out from the library. Email April Benz for more information. Osmo is a unique accessory that attaches to your iPad and allows your child (and you!) the opportunity to play with tangram puzzles, work on your spelling, improve your logic skills and become an artist! Some St. Agnes students have had the opportunity to try it out and they gave it a thumps up! Right now, Osmo has a fantastic opportunity! If you buy a Creative Kit from Osmo, they will give one to St. Agnes. Click here for more information.